Both tiles are stunning. I love the colouring effects you’ve achieved (I’ll have to try the clingfilm trick myself), the look of texture as well as colour. 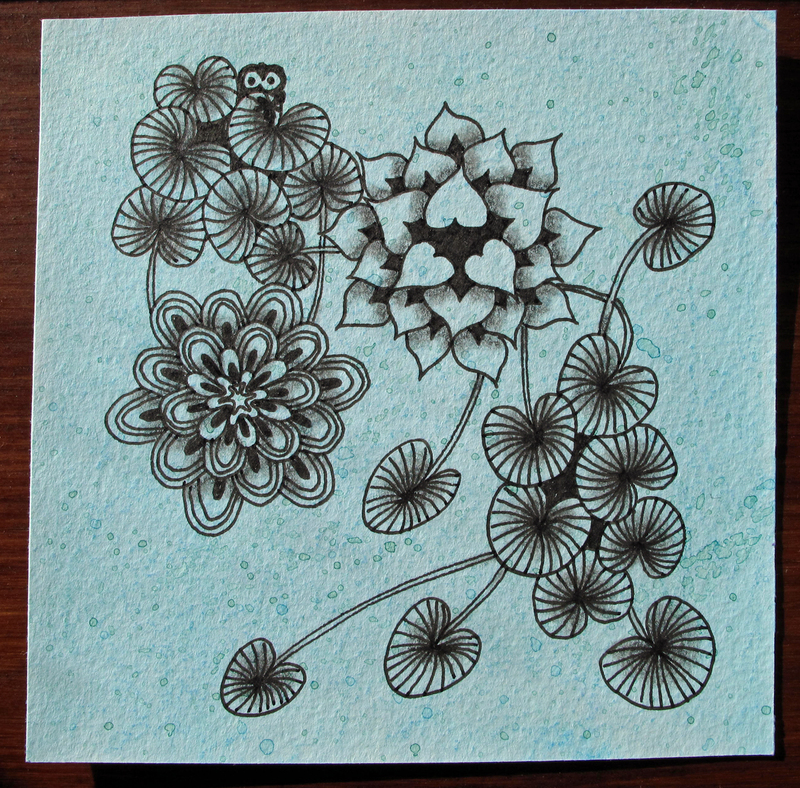 And great that you’ve left space in both tiles, to let the tangles stand out and move. Both tiles are beautiful. I love the Inktense pencils. What is the Cling film thing you did? Love them both. 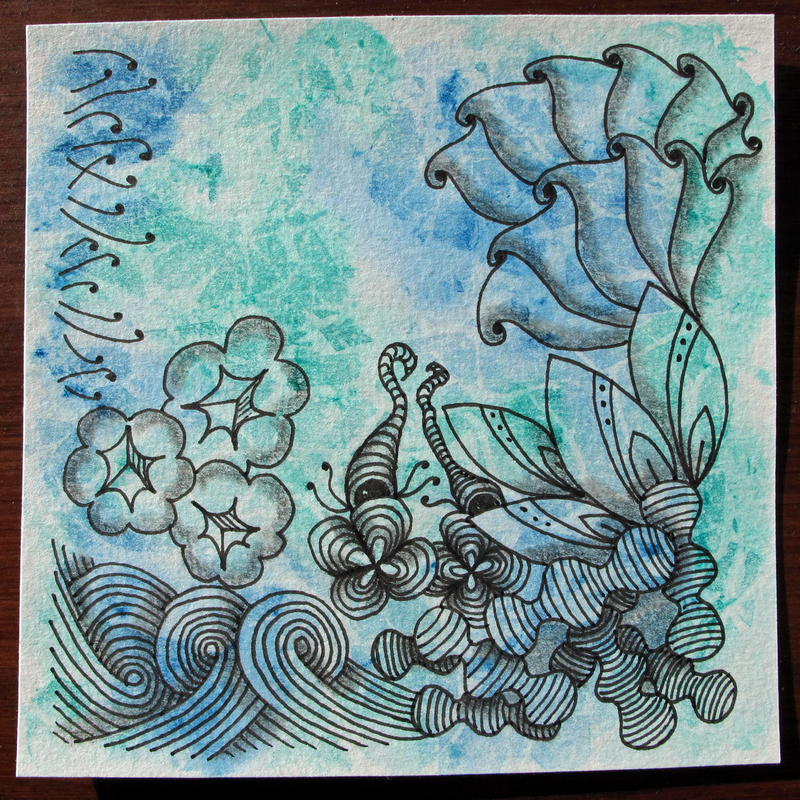 I really like the patterns you used in both – so representative of the ocean and then a pond! Awesome. Both tiles are great, I’m especially drawn to your second tile wonderful koi pond feel. Lovely work. Both are beautiful, and I love the texture with the cling film. Both of your Tiles are wonderful. Your background effects are beautiful and I love the results. Well done. two great tiles. I used inktense too, and it is very intense (but beautiful) – the cling film is a good idea and I think I will try this next time. Love your use of clam bake. Both are wonderful! Great choice of tangles and beautifully drawn! Wonderful background effect with the cling film! Pretty! I love the colors, they are so serene. And what creativity to use Pop’t in an underwater scene! delightful! Both of these tiles truly capture the water theme. It’s nice when people explain their process. Thank you for that. Nice work.